The concept of slippers fills our head with images of modern footwear, like the Uggs that ooze warmth and comfort. 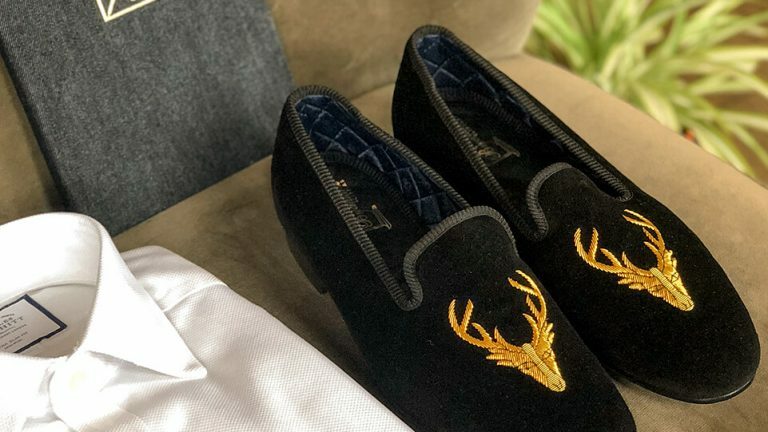 Interestingly, our traditional English slippers are taking the world by storm, being worn both in the house and outdoors. However, this iconic shoe isn’t a new trend. Indeed, the first pair were made and worn in the 1840s. Slippers themselves have a wealth of history behind them, the name slipper derives from the Old English language from the words “sliper” and “slipor” which mean “slip-shoe”. As described by Dr. Samuel Johnson: “A shoe without a leather behind, into which the foot slips easily.” Let’s summarise the extensive timeline of slippers and how they’ve become what they are today. Slippers are the oldest style of shoe in history, dating back to prehistoric times. The oldest surviving pair of shoes that have been found are slippers and are predicted to have been worn 10,000 years ago. This particular pair of slippers were made from woven fabric with a folded pocket to protect the toes of those wearing them and were strapped to the foot with a thong due to the lack of structure. Babouche is an adaptation of the Arabic word “babush” and the shoes were produced during the Cradle of Civilisation. They were described as slipper-like with an exaggerated point for the toe. This design was intended to highlight that the wearer cared about their lifestyle and appearance. As well as being worn for their unique aesthetics, Babouches are known for their extreme comfort due to the repetitive cleaning and drying process carried out when these slippers are made, making them an even more appealing fashion piece. Fashion and lifestyle magazine Vogue announced Babouches as the must-have shoe in 2016, and up to this day, traditional Babouches are still being made and worn in Morocco. Originally, it was viewed as inappropriate to wear shoes on holy ground, with many people removing shoes before entering a place of worship – this is a sign of respect and is symbolic of detaching oneself from the materialistic world. The only exception to this rule is seen in some parts of India where both the priests and those who work in holy places are permitted to wear wooden slippers. For some cultures, specifically the Middle East, displaying bare feet in front of others is considered offensive. The sole of your foot is viewed as dirty and the lowest part of your body, therefore, it shouldn’t be on display in front of others. However, the same views are held for shoes and are expected to be removed as a sign of respect, especially when entering someone’s home. The Koreans and Japanese opt to hide their feet with slippers and socks, also known as “sil nae hwa” which is translated into “room indoor shoes”. This style of slipper is the most extravagant; clog-like shoes that predominantly support the forefoot but are similarly lightweight and backless like most slippers. The term pantofles became a household name, particularly in France where it became a fashionable slip-on shoe. The most famous pair of pantofles to this date are those worn by the highly recognised Disney princess, Cinderella and her glass slipper (pantofle). Lastly, of course, we had to mention our Prince Albert slippers. After various styles of slipper before these, the Prince Albert trend began in the Victorian period and is still hugely popular today. This style of slipper was formalised to be worn outside when Prince Albert would attend black tie dinner events wearing them. Following this, they were often seen being worn by men outside the house to clubs and smoking rooms. Still to this day, Prince Albert slippers are worn to black-tie events, red carpets, and in clubs.